Kilima Kiu manor is a travel destination that has been developed from a regular ranch home into a exquisite boutique country home while preserving its unique charm of a wild savanna wasteland. Situated on the foot of Kilima Kiu hill, which locally means ‘that hill’, the home stands quietly surrounded by ranch that offers its visitors a private, relaxing, and memorable moment. Kilima Kiu manor hotel is located off Mombasa road, you branch off just past Konza and it takes about one- and a- half hour’s drive from Nairobi. Inside the home, the rooms are cosy with vintage décor with each of its rooms designed with a unique theme. Kilima Kiu manor is said to be one of the most charming boutique country homes in Africa with its pre-colonial age feel. 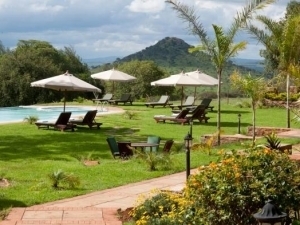 The ranch itself is a spectacle, with ostriches and cattle, trees and birds, a swimming pool and an outside lounge; it is a promise of fresh air and tranquility. Kilima Kiu manor offers a fantastic getaway from the hectic city life. It’s only 80km away from Nairobi and will take you one and a half hours to get here. There are seven rooms you can choose from, and every choice offers you its unique elegance and warmth. The wooden interiors are historical, yet impeccably maintained to ensure the most relaxing environment. Each room has a large king-size bed and is designed for two occupants. Kilima Kiu manor serves you a home-made dinner, with ingredients picked just outside from a garden. The stewards are on stand-by if you need as much whisky as your belly can accommodate. And when you wake up the following morning, you get a well served champagne breakfast. You can then opt to go for bird watching and see some of the most exotic birds in the world. You can choose a nature walk in the neighboring savanna or stay back and swim in the hot sun. There is also an animal conservancy in the area where you can see some of the most popular East African wild. Others choices are horse riding, dairy farm tours and biking over the Kilima Kiu hill. The exotic Kilima Kiu ranch was started by a British settler, Sir Frank Joyce, after arriving in Kenya in 1911. He then met Mary Early, with whom they married and settled in the area building the manor. The house has since changed owners severally, but it’s the current owners who went a step further and transformed the ranch into one of the most exciting getaway in the outskirts of Nairobi. Kilima Kiu manor offers exemplary hospitality standards, while giving a serene and vast space to interact with nature. The charges are Sh.35,000 per room per night or Sh.65,000 for two nights.